Building a Radio Telescope using an SDR receiver. One of the main aims of this project is to receive noise. Actually what we will be receiving is the energy produced by neutral Hydrogen atoms when its electron changes spin direction. 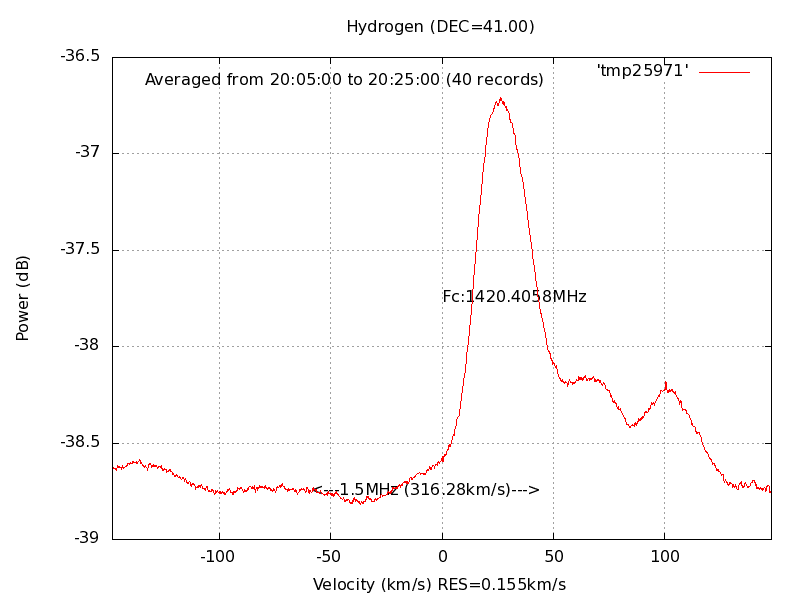 I don't want to get into the science in this blog but I have included a link for those that do ( Wikipedia Hydrogen line info ) but suffice to say that Hydrogen Atoms produce a radio signal on 1420 MHz that we can receive with our Radio Telescope. This is known as the Hl line and can tell us a lot about our Universe. We don't receive a signal just at 1420 MHz. Instead, because things in our Universe are moving away or towards us, the radio frequency is shifted slightly up or down due to the Doppler Effect much as a siren changes tone as it moves toward or away from us. Some classic Galactic Charts of the Milky Way show a pronounced peak in the frequency when we look at different parts of our Galaxy. This Hl chart recorded by Marcus Leech shows the offset from the center frequency of 1420.4058 MHz while centered on Cygnus. Note that the data shown in the chart is averaged over a period of 20 minutes from 40 samples. Marcus uses Gnu-Radio with an SDR receiver. We will have a look at this shortly. Our Milky Way Galaxy is in the shape of a disk with a super massive black hole at the center. As it has evolved over time, arms have formed in the disk allowing us to see greater density in different parts of the Galaxy. Our Solar System is located in one of the arms so we see different star density in different directions. The constellation of Cygnus lies in the area of one of the arms that moves toward us resulting in an increase in the frequency of the signal. If we looked elsewhere we might see a corresponding decrease in frequency if that part of the Galaxy was moving away from us. In a later post I will take us through building the hardware we will be mounting at the focal point of our dish antenna. While we are using a 2.4 Meter mesh dish to receive our neutral hydrogen it must be noted that a smaller dish will work although not as well. The above image from Marcus Leech was obtained through a system using a 90cm solid metal dish. The main difference with bigger dish size is a resulting larger signal peak above the noise. Noise sources can be external and internal. If we replace our antenna feed with, say, a 50 Ohm resistor at room temperature we see noise in our receiver system plus whatever our resistor produces. This is a good way to get a 'noise figure' for our receiver. Of course each part of our receiver contributes its own little bit to our overall 'internal noise'. When we connect our feed point antenna to the receiver our noise level should increase. If we point our antenna at the ground we will receive a higher level of noise. This is because warm objects emit radiation. If we then point our antenna at the sky we should see a drop in the level. We should now see a Noise Floor consisting of Internal Receiver Noise + Thermal Noise + Galactic Noise. I am building my receiver as a complete modular unit so I can swap out a section if needed. It consists of a horn and cavity made with copper and fiberglass PCB material with a monopole antenna (4.6cm) placed 1/2 wavelength (8.8cm) from the rear of the cavity. Following this is a 28db gain Low Noise Amplifier. This is our first source of unwanted noise. This should contribute only about 0.3db of noise to our overall receiver noise. Any noise created here will get amplified later so its best to have lowest noise figures early on. The next part of the receiver is a Bandpass Filter tuned to 1420 MHz. This limits unwanted signals on other frequencies getting into our receiver. Loss through the filter should be in the order of 1db and our 3db point is about 150MHz. I have used the microstripline 3 pole design from an article on SetiLeague.org 1296MHz Bandpass Filter and reduced the striplines slightly for 1420MHz. After this we have a second high gain low noise amplifier with approximately 20db gain and a noise figure of 0.8db. At this point the received signal enters the SDR. The Software Defined Radio consists of two devices. A radio tuner (this can be an E4000(60MHz to 1700MHz) or R820T(24MHz to 1850MHz)) which does the actual Radio Frequency Tuning and the RTL2832U which converts the RF signal to a digital I/Q signal then serializes it for our USB connection. These are available on Ebay now for around $10. I have read some reports but yet to run tests and confirm for myself that the SDR has a noise figure of around 3.5 to 3.7db. We need to plug our SDR into something. I'm using a Raspberry Pi computer as the host for our data as well as controlling the frequency of the SDR. In a previous post I have covered the software installed on the Raspberry Pi to interface with the SDR. Essentially the Raspberry Pi works as a server allowing us to connect to it from another computer. This can be a local computer a short distance away or if you have sufficient bandwidth > 2 Mb/s you can connect from the Internet. Our Raspberry Pi then works like a Data Pump with an IP address we can connect to. 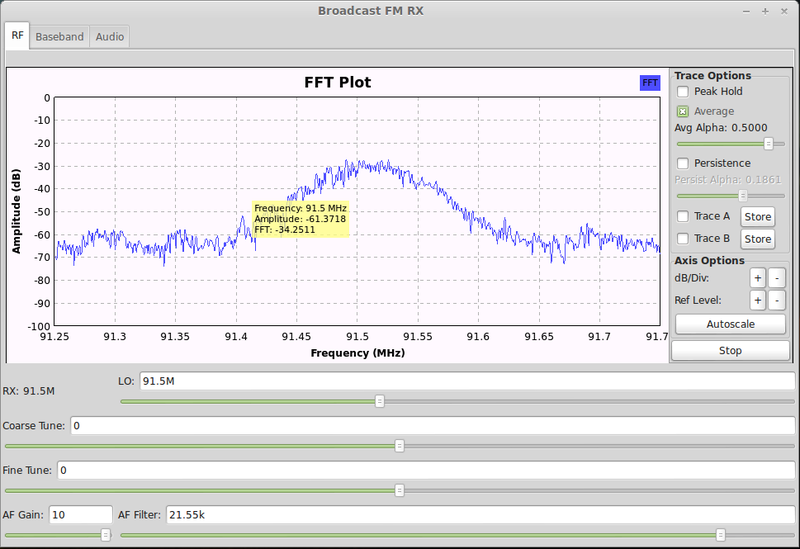 We can receive data packets that are digital samples of our RF data that was converted in the SDR receiver. Several different software packages can take this data and process it for us, whether it be SDR# on a Windows computer and present it as a spectrum / waterfall display or more preferably using Linux and Gnu-Radio and the massive advantages of designed block processing models with Gnu Radio Companion (GRC). Flow graphs can be designed in GRC to use the RTL_TCP block as a remote connected SDR receiver. Your Gnu Radio data processing can then occur on a powerful computer remote from the Dish Antenna and SDR receiver with its Raspberry Pi data pump. I thought I'd end this post with a quick run through for setting up your own data processing system. After having experimented over the last few months with different configurations I highly recommend Linux Mint as the operating system of choice. 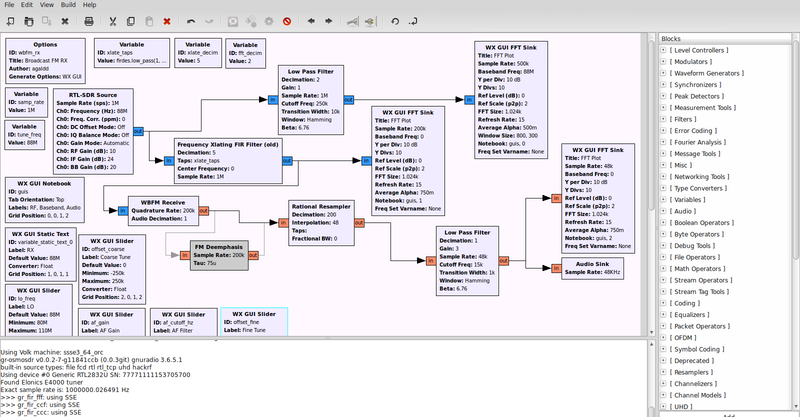 Gnu Radio installs and runs extremely smoothly and should have no problem with an SDR receiver as your signal source. I have a preference for Linux Mint 14 (Nadia with Cinnamon). They do have different desktop interfaces so you might prefer the later Linux Mint 15 'Olivia' with the Xfce desktop. Head over to their website at http://www.linuxmint.com/ and pick a version to try out. Its probably best to have a minimum of a Core2Duo processor and at least 2 GB of ram. Make sure you download the right version, either 64bit or 32bit, for your motherboard. Note that the 32bit version will run on 32 or 64bit hardware. You should see a list of Mirror sites. Download from one closest to you and save the ISO file. Burning the ISO to a disk will depend on your current operating system. If you have Windows 7 you'll probably have a DVD burner program. If not then it might be worthwhile googling how to burn an ISO to a DVD. Once you have your DVD ready, boot up your computer using the DVD with Linux Mint and go through the Live DVD experience. At the desktop run the Install Mint icon and fingers crossed you should now have installed Mint. Note that you can do a Dual Boot and have Windows 7 and Linux Mint on the one machine if you have the hard drive space. For our purposes though we want this to be our workhorse for analyzing our Radio Astronomy data. You should now have a working Linux Mint operating system. Its time to set up Gnu Radio. I've seen comments from many people on hundreds of forums that make hard work out of getting Gnu Radio installed and working. By far the best way is to visit Marcus Leech's website at SBRAC and get his script for installing Gnu Radio. The file at http://www.sbrac.org/files/build-gnuradio is a shell script. You should see text starting with '#!/bin/bash'. Copy and paste the text to a file on your desktop using Gedit or similar text editor and call it 'sbrac_gnu.sh'. Right click the file, select 'Properties' and tick the box to allow the script to execute as a file. We should now run the shell script. Right click and 'Run' or select 'Open in Terminal'. The script should now start checking for files it needs, downloading source files and compiles the software then installs it. This will take a long time! Be patient. On a slowish computer it could take over an hour. Once installed you should have a new menu item called GRC. Marcus Leech has written a brilliant Gnu Radio Flow Graph for Radio Astronomy called 'simple_ra.grc' which is anything but 'simple'. It does however provide some really useful tools for Radio Astronomy observation. Plug in your SDR receiver to a spare USB port and get started playing with Gnu Radio. I have set up a section on my Amateur Radio website at http://vk3xra.com/radio-astronomy-files/ with useful files I've collected including Gnu Radio Flow Graphs that you can plug in to GRC and experiment with your SDR receiver. My next post should have some interesting build information and photos of the Focal Point receiver hardware.